Based on cartridge yields for HP 131A compared with HP 201X Original HP LaserJet Toner Cartridges. For more information, see hp.com/go/learnaboutsupplies. Comparison based on manufacturers' published specifications (as of November 2014) and includes color laser printers with print speed between 11 and 20 ppm (pages per minute). Feature is only available for the HP Color LaserJet Pro M252dw. Mobile device must support near-field communications (NFC)-enabled printing. For more information, see hp.com/go/mobileprinting. Measured using ISO/IEC 24734, excludes first set of test documents. For more information see www.hp.com/go/printerclaims. Exact speed varies depending on the system configuration, software application, driver, and document complexity. HP Inc. The information contained herein is subject to change without notice. The only warranties for HP products and services are set forth in the express warranty statements accompanying such products and services. Nothing herein should be construed as constituting an additional warranty. HP shall not be liable for technical or editorial errors or omissions contained here in. Paper (brochure, plain), photo paper (HP premium, panoramic, plus tab), envelopes, labels, cards (greeting, index), transparencies. With HP JetIntelligence get 28% more pages per high-yield cartridge. Prices, specifications, availability and terms of offers may change without notice. Price protection, price matching or price guarantees do not apply to Intra-day, Daily Deals or limited-time promotions. Quantity limits may apply to orders, including orders for discounted and promotional items. Despite our best efforts, a small number of items may contain pricing, typography, or photography errors. Correct prices and promotions are validated at the time your order is placed. These terms apply only to products sold by HP.com; reseller offers may vary. Items sold by the HP.com are not for immediate resale. Orders that do not comply with HP.com terms, conditions, and limitations may be cancelled. HP's MSRP is subject to discount. HP's MSRP price is shown as either a stand-alone price or as a strike-through price with a discounted or promotional price also listed. Discounted or promotional pricing is indicated by the presence of an additional higher MSRP strike-through price. Comparison based on manufacturers' published specifications (as of November 2014) and includes color laser printers with print speed between 11 and 20 pages per minute (ppm). 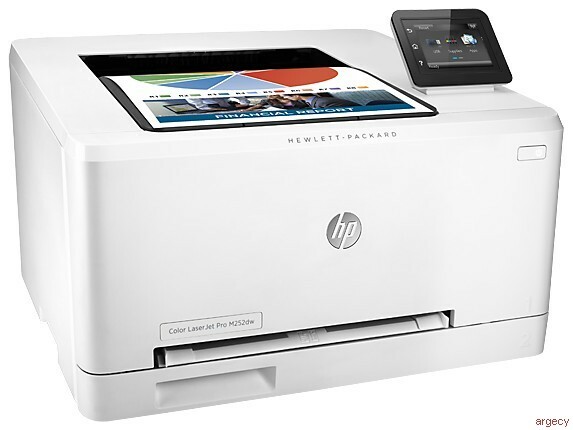 Feature is only available for the HP Color LaserJet Pro M252dw. Mobile device must be connected directly to the printer's wireless network prior to printing. Depending on mobile device, an app or driver may also be required. Wireless performance is dependent on physical environment and distance from the access point in the printer. For details, see http://www.hp.com/go/mobileprinting. Check your compatible device's official app store for HP ePrint app download availability. Requires an Internet connection to an HP ePrint-enabled printer. Printer requires ePrint account registration. App or software may be required. Wireless operations are compatible with 2.4 GHz operations only. Print times and connection speeds may vary. Wireless broadband use requires separately purchased service contract for mobile devices. Check with service provider for coverage and availability in your area. Learn more at http://www.hpconnected.com.